Star’- a dramatic monologue on the life of an iconic 18th Century actor. 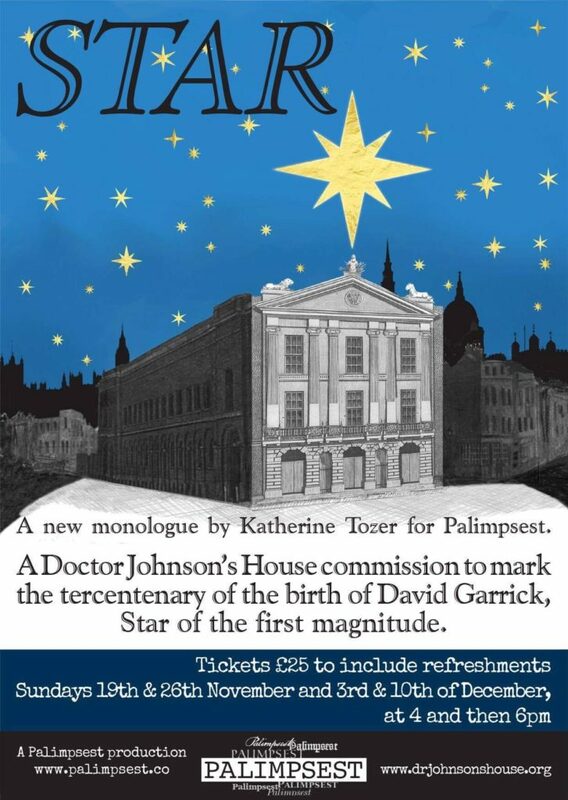 Palimpcest Productions return to Dr Johnson’s House with ‘Star’, a monologue delivered amid the exhibition ‘Johnson and Garrick: A Friendship in Constant Repair’. Both are part of the celebrations of the 300th anniversary of David Garrick’s birth. David Garrick came to London to seek renown as an actor- at which he excelled to the point of redefining the occupation. To quote his friend, mentor, and our absent host for the evening, Samuel Johnson, “His profession made him rich and he made his profession respectable.” This included creating a distinction between stage and audience, the convention of the audience remaining silent during a performance, and thorough private rehearsal. The monologue takes the audience on a canter through the life, times, achievements and foibles of London’s first professional actor. It is 1747, and at the height of ‘Garrick-mania’, Garrick is posing for a portrait three hours before his first opening night as manager of the Drury Lane Theatre. He is very nervy. There have been last minute revisions to the epilogue he is to recite, and the theatre has required significant repairs at great cost to his pocket and health. Garrick’s ambition, vanity and frenetic and mercurial energy are capably portrayed by Nick Barber. Katherine Tozer is the most thorough historical playwright working in London today, with keen attention to detail which she balances with a lyrical and euphonious understanding of language as spoken. The script is hugely challenging to deliver, shifting between implied extra characters, acting within acting, and with rapid changes in pacing and tone. In a nod to the setting in doctor Johnson’s House and to his long-standing relationship with the writer, there is a thorough peppering of the doctor’s quotes, as well as Classics and Shakespeare. This is pulled together in a way that is conversational and natural- the accidental monologue of the undiagnosed narcissist. My main feedback would be as a lapsed portrait artist- it’s a high energy short play and if only for the sakes of the poor imaginary painter Barber could easily get away with pausing a little longer between sections. For this one the exhibition before and after is required viewing – the monologue is thick with historical allusions and, while it stands on its own, the stream of conscious narrative makes more sense when put in the context of Garrick’s life and work, his wife Violetta, and his tumultuous friendship with Johnson. By the same token we enjoyed reviewing parts of the exhibit after the play, which gave them a lot more emotional resonance. Key exhibits that helped me understand Garrick as a character included an illustration of the spikes he had mounted at the front of the stage to stop the audience wandering on and assaulting the cast, and an engraving he comissioned ahead of his own funeral where angels bear him aloft to meet Shakespeare in some kind of posthumous arcadia. He thought a lot of himself- but then, so did everyone else. Overall? My company for the evening said he wished he had written it. High praise!